Happy Earth Day- Shop Green! 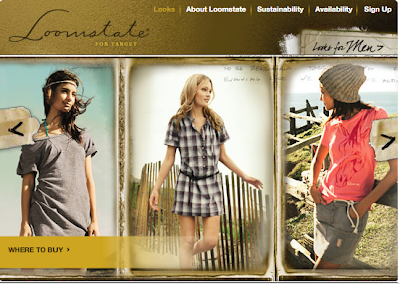 Loomstate is unveiling its new collection for Target. This eco-friendly line prides itself on its certified organic cotton through responsible farming and manufacturing processes. Let's hope that Target didn't spoil the whole idea by mass-producing this eco-line for its stores using bad labor practices and carbon-emitting factories. They claim on their site, however, that they like to take on organic lines, like Method cleaning products and Loomstate etc, because they are a massive corporation and have more impact on farmers than the smaller lines themselves. Hurrah! What are you waiting for? Unplug your toaster, turn the lights off, get in your Prius and drive the nearest Target immediately. Looking for more ways to be glamorously green? Try www.greenwithglamour.com. They have great gift ideas and even amazing vintage jewelry.